The Epiphone “1956” Les Paul Standard PRO features a solid mahogany body with a maple veneer top that delivers the classic tone and sustain that can only come from a “real” Les Paul. The “1956 PRO has single ply cream binding on the top for a beautiful vintage look. Like all Epiphone Les Pauls—unlike cheap imitations—the Epiphone “1956” Les Paul Standard PRO features a 14 degree angled headstock that gives you more pressure at the nut for longer sustain with less tuning hang-ups caused by “string-tree” gadgets. 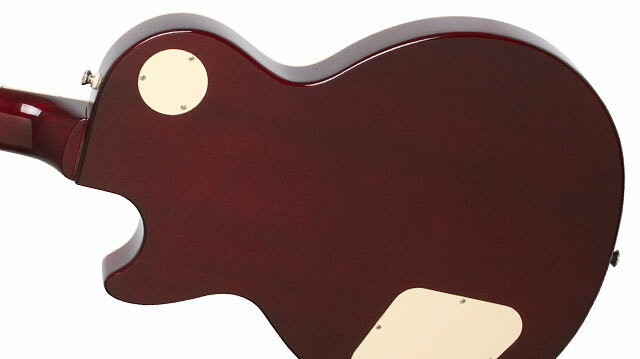 The Mahogany neck has a 24.75” scale with a 12” radius and features a beefier 1950s Rounded “C” profile with a glued-in neck joint for lifelong stability. The fingerboard comes with pearloid trapezoid inlays, 22 medium-jumbo frets, a 1.68” nut, and cream binding. The “1956” PRO comes in a Chicago Blue, Ebony, and Metallic Goldtop color finish. The Epiphone “1956” Les Paul Standard PRO now features new P-90 PRO pickups for that one-of-a kind vintage Les Paul sound. Epiphone P-90 PRO pickups feature Alnico V magnets, the same magnets used in sought-after vintage Les Paul with P-90s from the early 1950s. Alnico V magnets provide a rich, warm tone with a sparkling high end and a solid low end which makes the “1956” Les Paul Standard PRO one of the most versatile guitars around. Epiphone uses only the highest quality parts for its "PRO" pickups, including ABS plastic bobbins, 1010 Cold Rolled Steel pole shoes and pole screws, Alnico magnets, and the finest magnet wire available. The Epiphone “1956” Les Paul Standard PRO features Epiphone’s legendary rock-solid hardware including a LockTone™ Tune-o-matic fully adjustable bridge and a Stopbar tailpiece. 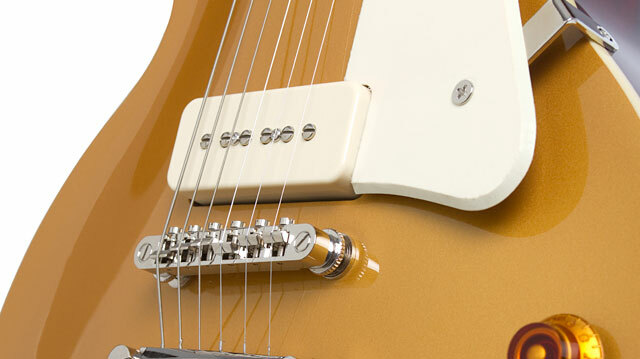 And now, Epiphone’s updated, patent pending design auto locks the bridge and tailpiece in place with no tools needed for that one-of-a-kind Les Paul sustain. 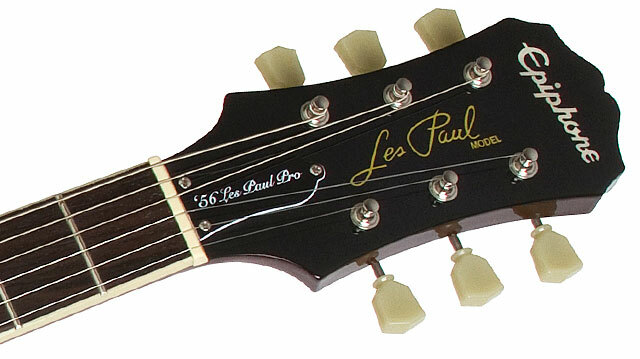 The “1956” Les Paul Standard PRO also uses 1” diameter potentiometers for better “throw,” longer life, and reliable service. And the all-metal toggle switch uses rugged spring-steel contacts to ensure years of reliable service and performance. Epiphone’s proprietary output jack features an improved contact shape and heavy-duty spring steel to increase reliability and Epiphone's new "Deluxe" 18:1 ratio machine heads making tuning easy and reliable.